Our suite is ready to go just bring your personal belongings, relax and enjoy. You are ready to go to your Home away from Home ! We pride ourselves in providing a very clean, tastefully furnished suite at a very affordable price. We are situated downtown in beautiful Saskatoon within walking distance of the river bank trails and just around the corner from beautiful parks. Cross country skiing on groomed trails available in the winter. Our suite is ready to go, just bring your suitcase. Enjoy over 900 Square feet of space which comes with secure building entrance, dedicated electrified parking, wireless internet, cable TV, all the kitchen and bathroom amenities you will need for your stay. We are offering a comfortable cost-reduced alternative to expensive hotel accommodations right in the heart of Saskatoon for vacation, medical stays, temporary work contracts, employee relocations, home insurance claims, business travel, short term and extended stays. You are minutes form commerce, shopping, dining, parks and entertainment. My Husband and I have been in the rental business for many years now. Our goal is and has always been to ensure good value, cleanliness (we have contracted a professional company) and comfort for a perfect experience. This is a very well constructed and sound proofed concrete building. This 950 sq ft suite is beautifully furnished and includes WiFi, in suite laundry, one dedicated electrified parking stall and cable TV. Just bring your suitcase, relax and enjoy the beautiful city view. Located in the heart of downtown Saskatoon close to many amenities, Shopping center, Restaurants, Theaters, hospitals, the river and parks. 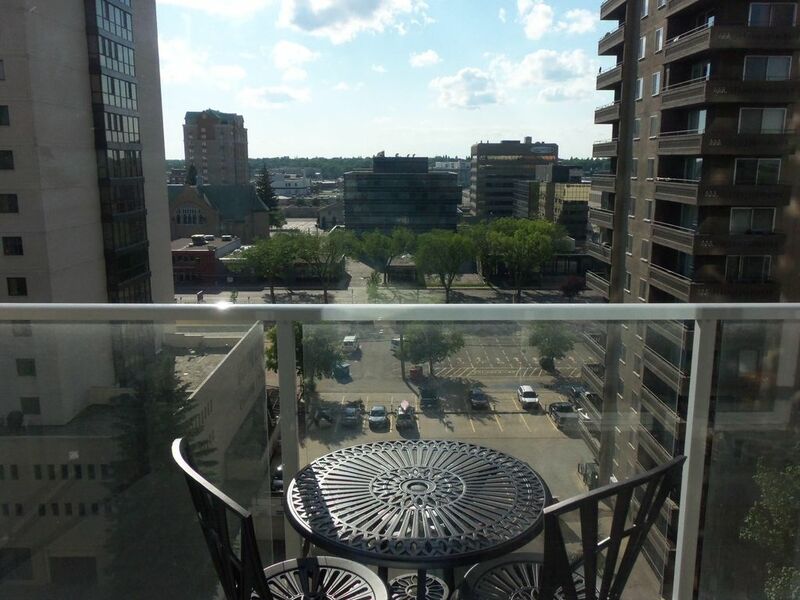 The View in Fifth is situated in the heart of Saskatoon downtown business district. You are within walking distance of restaurants, bars, shops, river and also close to the University and hospitals.